What does it mean to follow your dream? For Lao American artist Nor Sanavongsay, one part of the answer is to bring a beloved childhood story to life for the rest of the world. This February, award-winning artist Nor Sanavongsay is conducting a kickstarter campaign to fund the final production and development of Xieng Mieng: A Sticky Situation, the first story in a new series of Lao American children’s books. If the campaign is successful, they will be able to print at least 500 copies for families across the US and around the world. If the campaign is able to exceed expectations, he will be able to produce the other 4 books planned for the series. Trained in both design and programming of interactive media, Nor Sanavongsay has created award winning projects for retail giants such as Sears, Motorola, and many others. He’s well known across the United States for donating his time to design posters and flyers for community events and organizations across the US. He has presented at SatJadham Lao literary conferences as well as the National Lao American Writers Summit in Minnesota and the Lao Artists Festival in Elgin, Illinois. He currently lives with his family in the Bay Area. Laos traces its heritage over 600 years to the ancient kingdom of Lan Xang. In the United States there are approximately 200,000 Lao with the largest populations residing in California, Texas, and Minnesota. Many families came to the US as refugees following the civil war between 1953 to 1975, including Sanavongsay’s. This has been a project Sanavongsay has been developing for over 14 years. To cover the final production and development costs, he is holding a Kickstarter which will begin on February 1st and end on his birthday on February 28th. Crowdfunding has increasingly become a key way for independent and emerging artists to bring art projects such as children’s books to the public, especially when mainstream publishers have become averse to taking risks. A beloved folk hero of Lao literature, Xieng Mieng appears in many tales told by Lao elders over the centuries. A classic trickster figure, Xieng Mieng is admired for using his wits to constantly outsmart those who abuse their power or think too highly of themselves. While some object to him for making fools of those in authority, many Lao admire him for his intellect and wisdom, and his persistence in overcoming adversity and danger through his charm and education, rather than violence and force. Sanavongsay maintains a website dedicated to the project at www.xiengmieng.com. 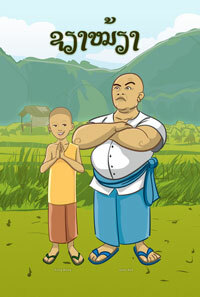 Contribute to the project at http://www.kickstarter.com/projects/nawdsign/lao-childrens-book-xieng-mieng-adventures.